On my, teal twice in a week! I'm in heaven! I saw a Pin using this leaf [that I just happen to have!] so I went with it. I do love the details this leaf has [Hero Arts Real Leaves] - in the different colors, I love it! The Fabulous is from CUTplorations. I tried to "shadow" the word, but it just looks off adhered. Oh well, it does look better in real life ;). Now its your turn. 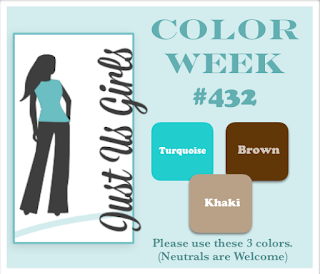 Come on over to Just Us Girls Challenge #432, and play along! The gallery should be gorgeous with these lovely colors. Teal for both challenge sites.....Your welcome, LOL. 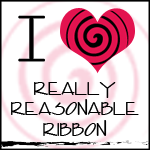 This is exactly what the card says...FABULOUS! Love that bold leaf stamp! Teal and you were meant for each other! These colors go so well together and I love your leafy design too! Your layered leaves are gorgeous! Love that big fabulous and I it looks shadowed to me. The layered leaves looks so beautiful and I am with you 110% in loving teal. Love the stitching on both panels and that awesome die cut sentiment! Oh, how realistic those leaves, both in size and detail! Perfect for this week's palette...LOVE this! Beautiful bold and bright. Of course I recognized your fabulous sentiments. What a fantastic layout and great use of the colors! I love that sentiment it does look super cool! Nice job with the challenge. Wow so bold and beautiful!!!! Love it! This is absolutely stunning ~ WOW!! Great card - love the leaves. I love it when one image can be used for a color challenge and this leaf was perfect for it, Vicki.